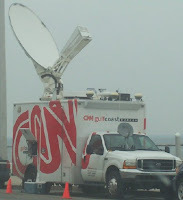 When you're at the beach and The Weather Channel and other media outlets show up with their mobile satellites, you know it's probably going to be a short vacation. Back at the hotel, when there's a note on your door warning you to not drink the water, your vacation feels pretty much doomed. When you turn on the television, to find out there's been e-coli in the water and they just now decided to tell you about it, your life suddenly feels doomed as well. Fortunately, we later found out that it wasn't the deadly strain of e-coli, and it's possible it was gone from the water supply before we drank it. Coliform bacteria, however, were probably still present. (Nice... We've been drinking poop with our lunch and dinner.) Restaurants were closing right and left because of a mandatory boil water notice, the store shelves were bare, ice was unavailable, and there's only so many times you can go to McDonald's in a week. So, we left early, :sob:. 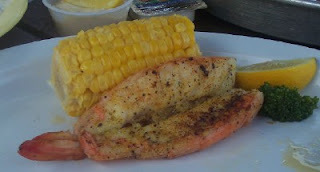 There are certain things I look forward to when we go to the beach -- eating crab, lobster, scallops, and shrimp cooked in unique ways is at the top of that list. I at least got to eat shrimp. (FYI: Pier 99 has a great shrimp platter for 2, and it actually fed 3 or 4 of us. 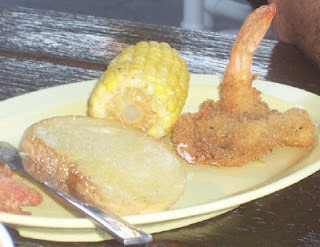 I especially enjoyed cajun shrimp, sautee'd shrimp, and one humongous fried shrimp our first evening there). But I can't end on a sad note. We did enjoy the time we spent there. The surf was calm. We knew the tropical storm was developing, so we stayed extra hours when we did go to the beach just in case it was our only chance. I am thankful I live in a country where I can go on vacation and 99% of the time I do have clean water. I am also thankful I live in a time when we could know from the radar that this was coming, so we didn't have to drive home in the pouring rain amidst tornado and flash flood warnings. I hope we can go back next year and finish our trip! I doubt I'll drink anything at their restaurants, though, or eat anything that was washed in their water, since their politicians can't seem to notify the public in a timely manner.